Select Telescope: Meade Lightbridge 12", Skywatcher 12"
Meade Lightbridge 12", Orion Skyquest XT12, Skywatcher 12"
It is safe to view the sun through this filter directly or mounted on a telescope, finder, spotting scope, etc. 99.999% of the sunlight is blocked. 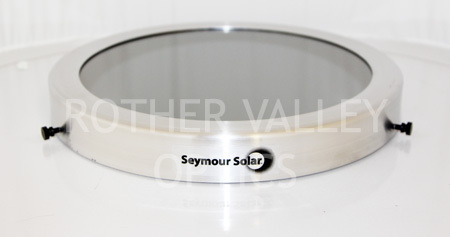 The aperture is made of a high quality, reflective coated glass and mounted into an aluminum outer cell. The filter is secured to the optical device with a nylon thumb screw. A natural yellow-orange image of the sun is viewed through the filter. It is packaged in a foam lined storage box, and included are instructions for use and care.